I thought I'd just check in with you about my March sewing project. I've gotten an early start this time and am trying to work on it in little spurts. 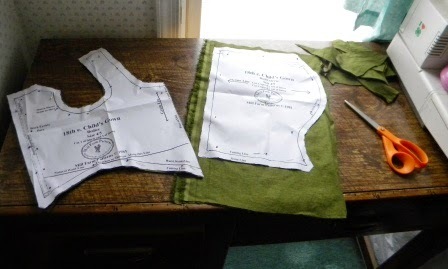 I'm going ahead with my 5 year old daughter's wardrobe and am making her an 18th century girl's gown to go with the shift I just made last month. So far I've got the bodice pieces (outer fabric, lining, and interfacing) sewn together and the skirt piece cut out. I need to order some boning for the back though. I'm pleased I'm making such good progress. Hopefully I'll have a completed dress to show you soon!